International Harvest, Inc of Mount Vernon, NY is recalling 14,620 lbs. of bulk and 24,270 bags of Organic Go Smile! Raw Coconut, because it has the potential to be contaminated with Salmonella, an organism which can cause serious and sometimes fatal infections in young children, frail or elderly people, and others with weakened immune systems. Healthy persons infected with Salmonella often experience fever, diarrhea (which may be bloody), nausea, vomiting and abdominal pain. In rare circumstances, infection with Salmonella can result in the organism getting into the bloodstream and producing more severe illnesses such as arterial infections (i.e., infected aneurysms), endocarditis and arthritis. The product was distributed to customers via online retailers, retail stores, and distributors. Product was directly distributed to the following states: NY, NJ, CT, CA, CO, OK, GA, VT, IL, FL, ME, WA, NH, and UT. Retail: International Harvest Brand Organic Go Smile! 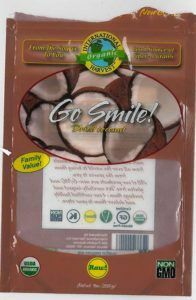 Dried Coconut Raw, in a 9oz poly/plastic bag, UPC: 7 39446 40220 7, with the following “Sell by Dates” on the back of the bag: 010118, 020118, 030118, 040118, 050118,060118, 070118, 080118, 090118, 100118, 110118, 120118, 010119, 020119, 030119. This recall is being initiated as a result of FDA’s laboratory analysis, which identified Salmonella in the product. We are working in cooperation with FDA to determine the root cause of the problem. Retailers that have sold bulk product should clean and sanitize the containers used to hold this product. Consumers who have purchased the product are urged to return it to the place of purchase for a full refund. Consumers with questions may contact the company at 914-699-5600 Monday – Friday 8:00am – 5:00pm.